Place the kale into a large mixing bowl and squeeze the juice of one lemon over it, sprinkle with the salt and toss together to coat the leaves and then leave aside to rest. Muddle the anchovies in a pestle and mortar with the walnut oil and set aside. Whisk together soy sauce, maple syrup and smoked paprika. Place the salmon fillets skin side up on a baking tray lined with foil and brush with the soy mixture. Cut the remaining lemons in half and place next to the salmon fillets. Grill with skin side up for 3-4 minutes, then flip the fillets and grill for further 3-4 minutes, or until tinged golden brown. 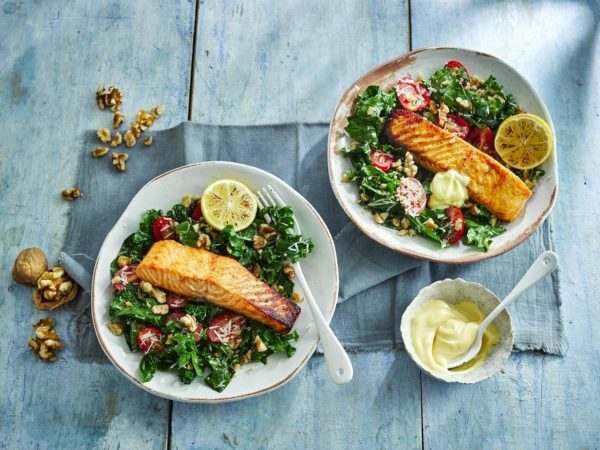 While the salmon is grilling, toss the California walnuts, tomatoes and parmesan together and add to the dressed kale, then stir the walnut oil and anchovy dressing through the salad. Divide the kale salad between four plates and top with the grilled salmon and lemon to serve.
. Combine water and quinoa in 2-quart saucepan; bring to a boil. In large bowl, whisk together walnut oil, lemon juice, oregano, cumin, salt and pepper. Add cooked quinoa and remaining ingredients; toss to blend. Makes 8 side dish servings. For Balsamic Dressing: Mix all the ingredients except oil together. Thereafter, add oil to the mixture and mix well with a whisk. Toast walnut in the oven at 170°C for 7-8 minutes. To make Parma ham chips: Arrange the slices in one layer, without overlapping, on a baking sheet lined with parchment paper. Bake in a 170°C oven for 8- 10 minutes, then turn off the heat and let the ham stay in the oven for another 10 minutes. Remove and cool, then break into shards. Clean, wash & dry rocket leaves, blanch asparagus in salted water for 3-4 minutes, remove with tongs and immediately transfer to iced water. 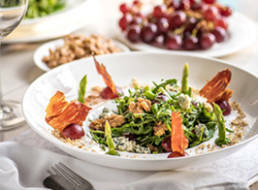 In a large bowl mix rocket leaves, grapes, asparagus, walnut & balsamic dressing. 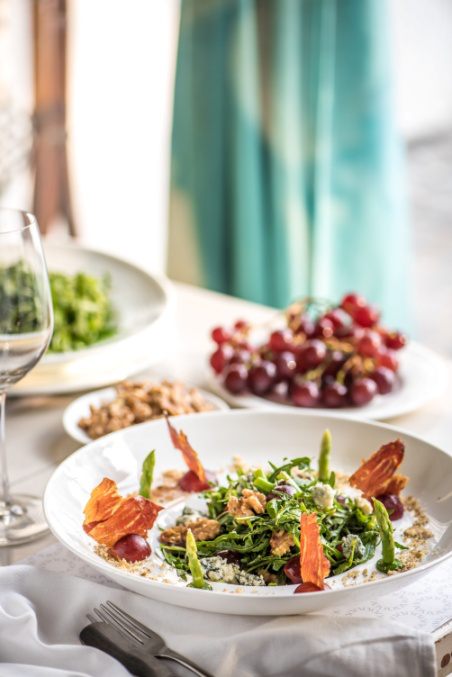 Arrange salad in individual bowls, garnish with walnuts and parma ham chips. 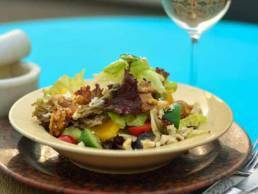 Finish the salad with crumbled gorgonzola cheese. For honey herb vinaigrette, whisk together vinaigrette ingredients in a small mixing bowl. Set aside. For salad, Preheat grill or indoor grill pan (a regular skillet will work too) over medium heat. Season chicken breasts with salt and pepper, place on grill, and cook about 4-5 minutes per side, or until juices run clear and chicken is cooked through and golden. Set chicken aside to rest. While chicken is resting, add walnuts to a small dry skillet and toast over low heat for 2-3 minutes, or until nuts are fragrant and slightly toasted. Coarsely chop walnuts after toasting. 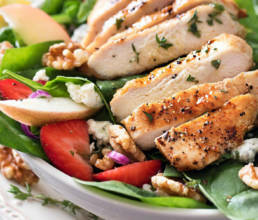 Place spinach in serving bowl, top with shallots, apples, strawberries, walnuts and blue cheese. Slice chicken and place on top of the salad. 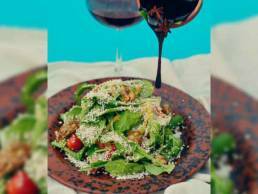 Drizzle with vinaigrette as desired and enjoy! Whisk together the jaggery, mustard, tamarind, lemon juice and green chilli. Pour the oil slowly while whisking to create an emulsion. Use as required in a salad. 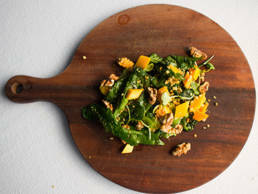 Toss the roasted peppers, rocket leaves and toasted California walnuts in the dressing. Garnish with the amaranth puffs and pumpkin seeds. Serve as soon as its ready or the leaves will start to droop. Whisk the mustard, tamarind paste and jaggery together along with the lemon juice. Pour the oil slowly into this while whisking to create an emulsion. Once done, check seasoning and refrigerate. Make caramel with the sugar and coat the California walnuts with the caramel individually and leave aside to cool. Toss all the salad ingredients in the dressing. Plate the salad and garnish with the crumbled feta cheese and caramelized California walnuts. For the pesto: Gather all of the ingredients in a bowl and grind to a creamy but grainy texture. Cook pasta according to the manufacturer’s instructions, drain well and allow it to cool. Peel the red onion and cut into thin slices. Drain the tomato from excess oil. Wash the strawberries and cut into halves. 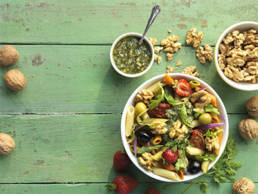 Together, in a large bowl, mix all of the ingredients except the walnut pesto, season with salt and freshly ground black pepper and a splash of olive oil and sherry vinegar. 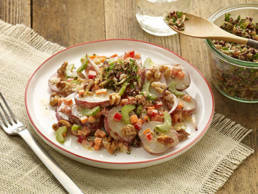 Separate the salad into serving size dishes and, once plated, top by spreading the walnut pesto. Toast California walnuts in a small skillet over medium/high heat for 3–4 minutes until lightly browned. 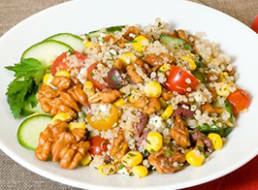 Place cooled California walnuts and first 7 ingredients listed in salad bowl. Pour puréed mango into salad bowl and stir well. Add orange juice, lime juice, minced garlic, olive oil and honey, season with sea salt. Sprinkle over salad and serve. Peel the potatoes, if desired, and cut them into coin-sized slices. Place in a pot with plenty of water, cover and bring to a boil. Lower the heat and simmer the potatoes until fork tender. Place the onions in a medium-large mesh strainer in the sink. Combine the olive oil, vinegar, garlic, salt and pepper in a medium-large bowl and whisk to blend. Add the minced vegetables, stirring them in; taste, adjust salt, pepper, and vinegar. Add mayonnaise or yogurt – and/or some extra olive oil, if desired. 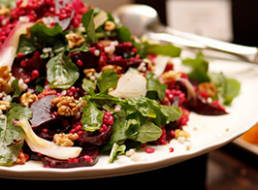 The salad is now ready to serve if you are planning to have it at room temperature. If you want it cold, cover and chill for at least an hour. To make the Gremolata, combine the olives, parsley, garlic and lemon zest in a small bowl and toss. Add lemon juice to taste and to moisten. 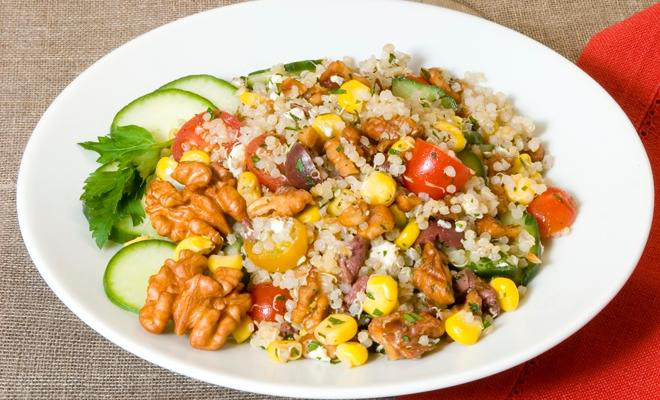 To serve: Stir the chopped walnuts into the salad. Prepare a bed of salad greens on each plate. Add a big spoonful of the salad, and sprinkle the top with Gremolata. Garnish with cherry tomatoes and hard-boiled eggs, if desired, and serve. 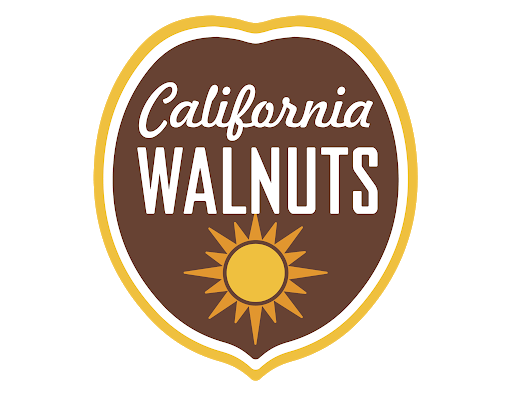 The California Walnut Commission (CWC), established in 1987, is funded by mandatory assessments of the growers. The CWC represents over 4,000 growers and 100 handlers of California walnuts in export market development activities and conducts health research. The Commission is an agency of the State of California that works in concurrence with the Secretary of the California Department of Food and Agriculture (CDFA).